This weekend was a good one! Thursday after work, I got my t-shirt quilt all stabilized and cut. Here is the rough layout. I took Friday off of work to go play in Tulsa with my family. We had a great time eating at Los Cabos (SO good! ), shopping at Ida Red (got some Hanson goodies! LOVE being in their hometown at a shop that supports them), and visited Whole Foods (WHY don’t we have one? )…but we did something really special too. We visited the Sherwin Miller Museum of Jewish Art. I heard about it a while back, and was dying to visit. We have Jewish heritage. My mom’s side of the family was of Jewish faith up until my mom…and our heritage is Jewish (like yours may be Irish or Welsh). 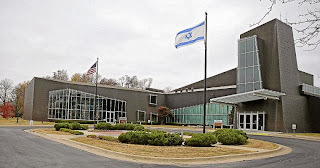 Coming from Jewish descent means a lot to me…and it’s something I’ve taken an interest in recently….so I REALLY wanted to visit this museum. Tulsa is only a couple hours away, but the museum is closed on Saturdays (Sabbath)…so we visited while I was off work on Friday. It seemed smallish, but we spend several hours there looking at the exhibits. It started upstairs with archeological stuff, including oil lamps from King David’s era and beautiful ornate Torahs (Jewish scriptures). Then we learned about all the high holidays, and saw many artifacts that were more familiar (like Mezzuzahs…little scroll holders you place on your door…my mom had one). There was also an art exhibit about sexuality that was interesting (Tyler wasn’t a fan! ha!) but one of the best parts was the downstairs with the Holocaust exhibit. Not only did they cover the Holocaust including video of Tulsa residents who spent time in Auschwitz, but also information about local racial tensions. I was just in awe all day. I couldn’t believe the stuff I was seeing was my heritage. What a rich heritage it is! So many beautiful ceremonies and traditions, so much respect for God’s rules and laws…and so much hurt during the Holocaust. My grandma thinks we have some distant relatives who were involved in the tragedy and I’d love to explore that more. But it really opened to my eyes to how special the Jews are to God, but also how much they are missing because they don’t know Jesus. I’ll get into that some other time…but let’s just say it was a great trip. When we got back to town, we tried AJ’s Oyster House for the first time. YUM!!! If you haven’t been yet, it’s in Brunswick Plaza in between 10th and 11th downtown. And SO good. Try the potato cakes and fried green tomatoes. SO good. Saturday, we decided to switch over the Straight Talk for our phones. The downside was buying used phones (and spending $$$ for them!) but man, it was difficult getting them set up. We had to travel 30 minutes away in Oklahoma to buy the activation cards because our town was sold out. Then we had to port in our phone numbers, back up our phones, restore the phones….and I had to take a trip to the cell phone repair store for some tech support. I spent ALL day doing this. From 10 AM to like 6:30 PM. I was spent and OVER it. So I chilled that evening while Tyler was at his grandpa’s. I had a cheese plate for dinner and wine in the fancy crystal. Made it all better. Sunday after church, we took my sewing stuff to mom’s. When they moved, they have a big hallway with shelving on one side…and I thought it would be perfect for a sewing area. So they let me bring over my stuff and we got it all set up. I now have a sewing area! Woohoo! I got the entire topper of my t-shirt quilt complete! Sunday evening, Tyler went to play volleyball at church…and me and Mikey relaxed and got caught up on the DVR. It was a great mix of fun, productivity, and relaxation. Did you have a good weekend? What is your family heritage? That heritage museum sounds amazing!! What a cool opportunity. And now I’d like some cheese and wine, thanks. Okay, somehow I missed this post! How did that happen?!?! Anyway… now I’m dying to visit the museum in Tulsa!!! It sounds amazing! And girl, “rich heritage” is an understatement! Ha! I mean, I can’t even begin to tell you all that we learned about the amazing Jewish people when we were in Israel! It would take me a solid week to tell you all about it. My blog doesn’t cover half of what we learned! And I have a funny story to tell you about the mezuzah’s! Remind me to share it with you sometime… you’ll laugh at us! I love you, Brittney! And I love “your people” so much more than I ever thought possible! God is faithful!